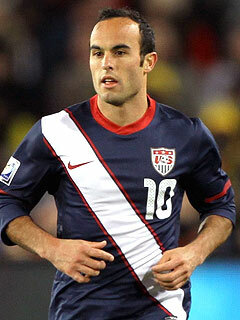 We had a family birthday earlier this week in Beemsville, and today is also Landon Donovan’s birthday. LD is the greatest player to lace ’em up for Team America, the best player in MLS, and we’ve truly enjoyed watching him over the years. At 29, he’s the Captain, leading all-time scorer with 45 goals, and he still has another World Cup Cycle (at least) before he’s through. Like any athlete he’s had some ups and downs, but leads the Red, White, and Blue with class and skill. And so, in the best youtubery tradition, we bring you all 45 Donovan goals. Happy Birthday, LD!